At the request of the URENCO Corporation, the National Security Archive has removed the image of the cascades of gas centrifuges that first appeared with this posting. 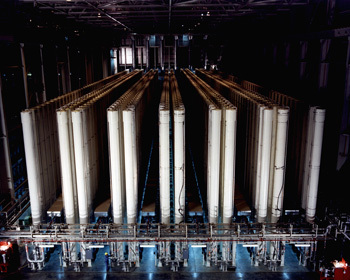 The image depicted part of the interior of URENCO's uranium enrichment plant in Amelmo, the Netherlands. Having found the image on the International Atomic Energy Agency's Image Bank, the Archive's staff assumed that it was in the public domain, not least because it has been widely used in publications over the years. As it turns out, URENCO claims a proprietary right to the image. The IAEA has also since removed it from its Image Bank at URENCO's request. URENCO rejected the Archive's subsequent request for permission to use the image on the grounds that the corporate Security Office objected. Washington, D.C., July 23, 2012 – The possibility that highly motivated countries, such as Iran in today's environment, could secretly build gas centrifuge plants to produce highly enriched uranium was foreshadowed over fifty years ago by senior officials at the Atomic Energy Commission (AEC) and its contractors. They perceived that countries determined to acquire a nuclear weapons capability could secretly build gas centrifuge facilities to enrich uranium, although it required solving complex technical problems. A recently declassified Union Carbide Nuclear Company report, published for the first time today by the National Security Archive and the Nuclear Proliferation International History Project, declared that "in general, it would not be too difficult to build a relatively small clandestine gas centrifuge plant capable of producing sufficient enriched uranium for a small number of nuclear weapons." AEC contractor Union Carbide found that even a relatively underdeveloped country could covertly develop a centrifuge plant for a nuclear weapons program, although to do so in a shorter time frame it would need assistance from other countries with more experience in the technology. This is what later happened with Pakistan, which used Dutch-German-British technology stolen by A.Q. Khan, and with Iran, whose Pakistan-assisted centrifuge program remained largely secret until 2002. An AEC study [document 6] which found that the gas centrifuge method posed a somewhat greater proliferation risk compared to the "plutonium reactor route" because it was a "slightly more attractive" method of producing fissile materials. According to the study, while reactors had a "proven" track record as a source of fissionable material, they required more specialized equipment, more labor power, were difficult to hide, and required more uranium, among other considerations. According to the Union Carbide study [document 4] "Class X" highly industrial countries with up-to-date educational systems, such as Germany or Sweden, would need about 5 years to get to the point where they could produce HEU with a gas centrifuge. Class "Y" intermediate countries with "limited internal industrial activity," such as Israel or Brazil, would require about 6.5 years to reach the point where they could produce nuclear weapons with the help of gas centrifuges. "Class Z" non-industrial countries with low technological levels, such as Cuba or Egypt, would take about 8 years. They would, however, need the assistance of a "Class X" country and would have difficulty building a completely clandestine plant." AEC experts found that West Germany had the "most extensive and most complete gas centrifuge program in the world at this time" and as long as their work proceeded on an unclassified basis it could aggravate the "Nth power" problem. For example, the AEC's director of classification worried that an "unfriendly" country like China might someday acquire the gas centrifuge on the open market [see documents 2 and 6]. AEC and Union Carbide studies recognized that an important technical problem to be solved was how to operate a "cascade" of gas centrifuges so that they could produce HEU in large quantities. The 1960 Union Carbide study argued that an important element of the time required to develop a gas centrifuge plant was to "solve the problems encountered when one attempts to connect large numbers of centrifuges together and run them in the series-parallel arrangement which constitutes the separation cascade." Union Carbide revised its estimate of the time frame for building a centrifuge plant in 1964, finding that class "X" countries would require 8 years, but 5 years if they had some "technical knowledge" of U.S. developments. Class "Y' countries would need about 9 years, but about 7 years if they had knowledge of U.S. developments. They would have to import some hardware and equipment. Class "Z" countries could not develop centrifuges on their own, but with technical advisers, knowledge of U.S. developments, and imported equipment, they could do it in about 9 years [see document 9]. During the following decades, scientists in the United States, Germany, the United Kingdom, the Netherlands, and the Soviet Union found that the gas centrifuge technique had great potential to produce enriched uranium cheaply, efficiently, and effectively. Documents recently declassified by the Department of Energy shed light on late 1959-early 1960, when U.S. policymakers, already worried about the spread of nuclear weapons, became aware of the risk posed by the gas centrifuge. Since 1957, the Central Intelligence Agency had been coordinating the production of National Intelligence Estimates forecasting the prospects for further proliferation of nuclear capabilities and U.S. intelligence had discovered the existence of the Israeli nuclear program. The NIEs found that a world with more nuclear powers would pose difficult and undesirable challenges to U.S. influence in world affairs. In this context, the proliferation of gas centrifuge technology could aggravate what policy advisers were beginning to characterize as the "Nth" country problem (that some indeterminate number of countries might develop a nuclear capability). What contributed to high-level concern about nuclear proliferation via gas centrifuges was not only that such countries as West Germany had a "lead" in the technology, but that their research and development programs were unclassified. The Germans and the Dutch were developing the technology for commercial purposes, so they could produce HEU for nuclear power reactors and eventually eliminate their dependence on U.S. supplies. The German and the Dutch programs, however, were completely uncontrolled at the time and the AEC saw a risk of proliferation if the technology leaked or if high capacity machines became available for export. Brazil had already purchased a number of machines several years earlier. While the AEC had declassified some findings from its classified centrifuge program, it was starting to tighten up controls, and concerns mounted that U.S. classification actions would be irrelevant if Dutch or West German centrifuge technology was unclassified. Gas centrifuge technology developed further during the 1960s and 1970s, and began to operate on an industrial scale in the three countries--West Germany, the Netherlands, and the United Kingdom--which established the URENCO consortium. Such operations remained confined to a handful of countries until the mid-1970s when Pakistani technologist A. Q. Khan stole blueprints from the Dutch URENCO plant in Amelmo in the mid-1970s. Within a few years, the Pakistani nuclear establishment had acquired dual-use technology from a number of suppliers that it used to establish a secret uranium enrichment plant at Kahuta. While the United States and allies attempted to halt or at least slow the Pakistani nuclear program, it was a half-hearted effort because Cold War priorities precluded a forceful nonproliferation policy. Indeed, during the 1990s, A. Q. Khan disseminated gas enrichment technology to Iran, North Korea, and possibly India. A returned German prisoner of war from the Soviet Union may have been one of the U.S. government's earliest sources on the Soviet gas centrifuge program. His full name presently unknown, Kaiblinger may have been a highly skilled machinist who could use lathes to produce complex equipment. Apparently working in the late 1940s at Manfred Von Ardenne's Institute "A" --located in a former sanitorium in Sinop, Georgia -- Kaiblinger helped with Max von Steenbeck's centrifuge project. He did not see much progress; for example, he reported a comment by one of the Germans, Steudel (first name unknown or "fnu"), that "it could not actually be expected that the centrifuge system would ever be applied on an industrial basis." Kaiblinger provided the U.S. with detailed information on the institute, including a diagram of a centrifuge and the names of scientific workers, among them "Dr. Gerhard [sic] Zippe, a "mechanical physicist [who] worked on preliminary experiments of the development of the centrifuge." Despite the slow start, by the 1950s the Soviet centrifuge process was a highly successful one that, through Zippe's influence, shaped developments in the West. The AEC's policy to declassify information on the gas centrifuge had a loophole-information could be classified when the technology "could reasonably be used for the production of large quantities of U-235." According to C.L. Marshall, the Netherlands and West Germany were making substantive progress in developing gas centrifuge technology and would eventually be able to build a "working plant for the mass production of U-235." New technology which would make that possible needed to be classified, he argued, because it would enhance the capabilities of an "unfriendly nation" to produce isotopes. Marshall pointed to China as one such country, although he was mistaken to argue that gaseous diffusion technology would not be in Chinese hands "for many years to come." 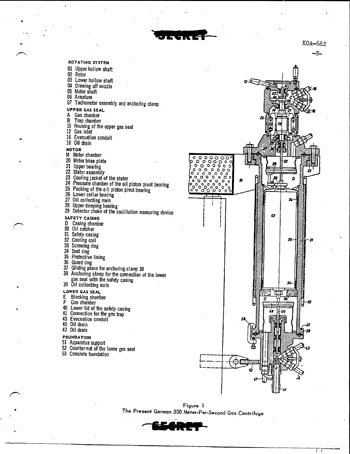 To keep gas centrifuges off the "open market," Marshall proposed amending classified U.S agreements with the Netherlands and West Germany so that it would be possible for both countries to cooperate with the United States on the development of gas centrifuge technology on a restricted basis. Algie A. Wells developed Marshall's themes in a longer memorandum to the Department of State. Citing a recent study by the General Electric Co., Wells suggested that it was a matter of time before it was possible to produce U-235 with gas centrifuges at a "cost roughly equivalent to our published prices" of enriched uranium produced with gaseous diffusion technology. Already the West Germans were "if anything, enjoying a slight lead" over the United States, but 20-30 other countries had the skills needed to develop the technology. The proliferation risk posed by the gas centrifuge compared to the "plutonium reactor route" was a "slightly more attractive" method of producing fissile materials. Yet, the Dutch and the German programs were proceeding on an unclassified basis so "any classification action the Commission might take could be vitiated if the German activities were to proceed on an unclassified basis." To "mitigate to some extent" the risk of nuclear proliferation, Wells proposed that the United States negotiate agreements with the Dutch and the Germans to classify and safeguard gas centrifuge technology. Cooperative research could be helpful by increasing the speed of U.S. progress but would also "enhance control" by the U.S. of the technology. With the complex diplomatic issues raised by the gas centrifuge, Wells asked the State Department to contribute its thinking. This contractor report deeply informed the thinking of AEC officials. Its chief conclusion was that "in general, it would not be too difficult to build a relatively small clandestine gas centrifuge plant capable of producing sufficient enriched uranium for a small number of nuclear weapons." Industrial countries would have less trouble building and hiding such facilities but, according to Union Carbide, even a nation with "relatively limited industrial activity" could use this technology to produce a nuclear weapon in 8 years. The Union Carbide study suggested that building a clandestine gas centrifuge plant was a difficult task but that a determined country could do it. What would make the technology attractive to a would-be proliferant was that the centrifuges could be relatively small (less than a foot in diameter) and mounted vertically, which meant they needed little floor space. A building of "modest dimensions" could contain a small centrifuge plant and it would be "difficult to detect, especially in an industrial country." Moreover, compared to the expensive gaseous diffusion enrichment process, the centrifuge method was relatively cheap---four megawatts would be required for the annual operation of a small plant compared with hundreds, perhaps thousands, of megawatts for a gaseous diffusion plant. To gauge the proliferation risk, Union Carbide looked at countries at three stages of development. "Class X" highly industrial countries with up-to-date educational systems, such as Germany or Sweden, would need about 5 years to get to the point where they could produce HEU. Class Y" intermediate countries with "limited internal industrial activity," such as Israel or Brazil, would require about 6.5 years to reach the point where they could produce nuclear weapons with the help of gas centrifuges. "Class Z" non-industrial countries with low technological levels, such as Cuba or Egypt, would take about 8 years. They would, however, need the assistance of a "Class X" country and would have difficulty building a completely clandestine plant. " Those countries that found a way to produce gas centrifuges for a nuclear weapons program would have to solve other technological problems. Producing HEU for a nuclear weapon would require the creation of a "cascade" of interconnected gas centrifuges and "there has been no indication that anyone has successfully run even two interconnected centrifuges." This, however, was a problem of "plant design and process control" that could be solved. Moreover, a high-speed centrifuge required "suitable material" capable of withstanding high velocities. A "class X" country could solve these and other problems within the stipulated eight years. The AEC's report to the State Department generated concern over the proliferation risk of unclassified gas centrifuge research, but the Department had no clear answers. While Philip Farley, the secretary of state's adviser on atomic energy policy, believed that the Dutch and the West Germans might be able to impose export controls, he thought it might be more difficult to secure West German cooperation to classify the latest developments in the technology. The Germans were likely to be reluctant to classify because it could "raise suspicions" among their neighbors that they had a nuclear weapons program under way. An alternative was that the European Atomic Energy Community (Euratom) could request its members to classify the technology but this raised the risk that the information would become available to the French. So far the US AEC had been unable to "approve the French AEC for security." An alternative to classification by Euratom or classification by national governments would be "informal commercial restrictions." The Atomic Energy Commission staff reviewed a number of developments which informed its support for action to classify the gas centrifuge program in the United States and overseas to mitigate proliferation risks. They took into account Union Carbide's findings and a recent General Electric study, which found that in five years (including three years of development) the United States could build a gas centrifuge plant which could produce U-235 at prices competitive with the AEC's current price structure. Other studies showed that the "centrifuge route, as compared with the reactor route … would be the easier to pursue both covertly and overtly." Moreover, recent developments, including Zippe's work at the University of Virginia, demonstrated the potential of the gas centrifuge: "the simplicity of [the Zippe group's] presently developed unit, along with materials improvement developed in missile programs, indicated the feasibility of a short tube unit showing considerable potential for isotope separation." Finally, the fact that the Germans already had the most complete and most extensive gas centrifuge program in the world at this time" made AEC officials want to prevent widespread dissemination of their knowledge. Yet, if the Germans and Dutch were resistant to classification, the AEC was willing to consider the possibility of putting its work on a nonclassified basis. The AEC study treated classification and the application of safeguards as important to preventing the dissemination of knowledge about the latest developments, but AEC officials also proposed looking at the possibility of U.S. collaboration with the West Germans and Dutch centrifuge projects. Although the State Department's reaction to AEC proposals for classification and cooperation was equivocal, the Commission staff was determined to go forward. One of the recommendations to the AEC General Manager was to hold "exploratory discussions" with the Dutch and West German governments on the possibility of classifying the latest gas centrifuge technology. The Atomic Energy Commission also approved a staff recommendation for talks with the British, Dutch, and West Germans on classification and control issues. The letter that General Manager Luedecke sent to Farley on 22 April transmitted the AEC's support for the prompt initiation of "exploratory discussions" to "seek control of gas centrifuge equipment and materials and control of centrifuge technology." The AEC and the State Department could send a team of officials to Western Europe to hold such talks. This study extended and refined the 1960 Union Carbide study by taking into account the latest technological developments. Drawing on the results of the AEC gas enrichment program, it supported the basic conclusion that countries at more advanced stages of industrial development would be able to build a gas centrifuge plant for producing nuclear weapons on a clandestine basis. Significant information has been excised from this version of the document, including details on the progress of Union Carbide's successful efforts to produce high-speed gas centrifuges and a functioning cascade. These details are protected under the Atomic Energy Act's "restricted data" controls. Also heavily excised, to protect foreign government and intelligence information, are details of overseas centrifuge developments, including in the United Kingdom, West Germany, the Netherlands, as well as the report's conclusions about the time frames needed for class X, Y, and Z countries to build a gas centrifuge plant. A summary prepared in 1965 for the White House, reproduces the key conclusions (see document 9). 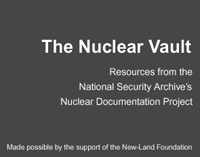 Nevertheless, the release includes interesting information, such as the discussion of the considerations that could lead countries at various stages of industrial development to choose between plutonium-reactor and gas centrifuge routes for acquiring a nuclear weapons capability. In this letter, Seaborg retransmitted the 1964 Union Carbide Nuclear Division study on gas centrifuges and the "Nth Power" problem, while bringing up additional points. He described the AEC's recent efforts to tighten controls over the dissemination of gas centrifuge technology, the latest development being to restrict access to the AEC's latest data to private industry. While understandings with the Netherlands and West Germany to keep gas centrifuge technology classified remained in place, the Germans strongly opposed U.S. proposals to formalize them, probably so that they could retain their freedom of action. The summary of the 1964 Union Carbide Nuclear Company study includes information that the Department of Energy withheld in its recent release of the full study (see document 8 above). The key withholding concerns the estimates of the time frames needed for class X, Y, and Z countries to build gas centrifuge plants on a clandestine basis. As in the 1960 study, class X countries were those in an advanced state of industrial and educational development, such as Sweden, Japan, and West Germany; class Y countries had more "limited" development, such as Brazil, India, and Israel, while class Z countries had "little technological" or industrial "skill", such as Egypt, Peru, or Pakistan. According to the estimate, to develop a small plant capable of producing enough U-235 for a nuclear weapon, class X countries would require 8 years, but 5 years if they had some "technical knowledge" of U.S. developments. Class Y countries would need about 9 years, but about 7 years if they had knowledge of U.S. developments. They would have to import some hardware and equipment. Class Z countries could not develop centrifuges on their own, but if they had technical advisers, knowledge of U.S. developments, and imported equipment, they would need about 9 years. Physically concealing the plants "should present no problem." The velocities at which U.S. centrifuges could operate, which presumably could serve as a goal for other countries, was excised by DOE.
 . For an early report on the discovery of the Iranian gas centrifuge program and what U.S. intelligence learned about it during the 1990s, see David Albright and Corey Hinderstein, "The Centrifuge Connection," The Bulletin of the Atomic Scientists, March/April 2004, 51-66. For an overview, see Houston G. Wood, Alexander Glaser, and R. Scott Kemp," The Gas Centrifuge and Nuclear Weapons Proliferation ," Physics Today 61 (2008): 40-45.
 . For useful background, see R. Scott Kemp, "The End of Manhattan: How the Gas Centrifuge Changed the Quest for Nuclear Weapons," Technology and Culture 53 (2012): 276-279.
 . Kemp, "The End of Manhattan," 293-297.
 . For a useful account of the German role in the early Soviet nuclear program, see Pavel V. Oleynikov, "German Scientists in the Soviet Atomic Project," Nonproliferation Review 7 (2000), especially pages 11-12 and 22-23.
 . China had already begun construction of the gaseous diffusion plant at Lanzhou, which was completed in 1963; see John Wilson Lewis and Xue Litai, China Builds the Bomb (Stanford CA: Stanford University Press, 1988), 113-125.
 . R. Scott Kemp, "The End of Manhattan," 291.